Call centre industries are possibly one of the toughest environment you could ever deal with, but there are still a few agents and managers that might term it as living in the hell. Having a deal with frustrated callers, a strict work schedules, penny pinching management and super high expectation do not generally make things easier for them. To work in a call centre industry can turn out to be more stressful to say at least, and is not something for a weak heart, and as many managers can attest to. There are umpteen challenge faced by the call centre industry and here are some of the major challenges that the call centre generally faces frequently. Through digital and social media channels reshaping the expectations of all the clients and customers, increasing business competition making it hard enough for all the call centres to meet the expectations of the clients and customers. And with evolving customer expectations the customer attribution continues to increase, where they begin to expect immediate service through the channel that they generally prefer or choose to work. Complicated products and services would here lead to complicated customer problems. And as a result contact centres in the technology sector would here need to be able to route the callers of their organization through the right agent for each and every problem that they have been facing. Customer attribution has been a huge problem in the call centre industry. And at some point or the other the customer would here decide to deliberately end the deal with the service that has been provided or opt to avail the services that your competitors are having for a wide variety of reasons. The cost of such can turn out to be humongous. First call resolutions is generally regarded to be one of the most important factor in order to achieve customer satisfaction in the call centre industry. However the customers today tend to ring with increasingly complex queries, it is not possible to provide an immediate answer to all their queries. If the callers here end up speaking to several agents regarding this, then the customers turn up to become diluted and satisfaction levels plummet. Social media generally poses threats to call centres when it comes to bad experiences. Customers generally vent out information on social media in order to remove their frustrations. When ticked off then begin to react in the ways that end up being a nightmare for most of the business organizations. Online review websites, Twitter, Facebook and the other social media websites could here help you magnify one of the worst experiences that they have had with the organization, and is disastrous to the reputation of your business organization. 140 character tweet could be read by millions of people in just a matter of minutes. The call centre organizations in turn should train the call centre agents in order to be social media savvy to overcome the broad cast of worst experience across different media. 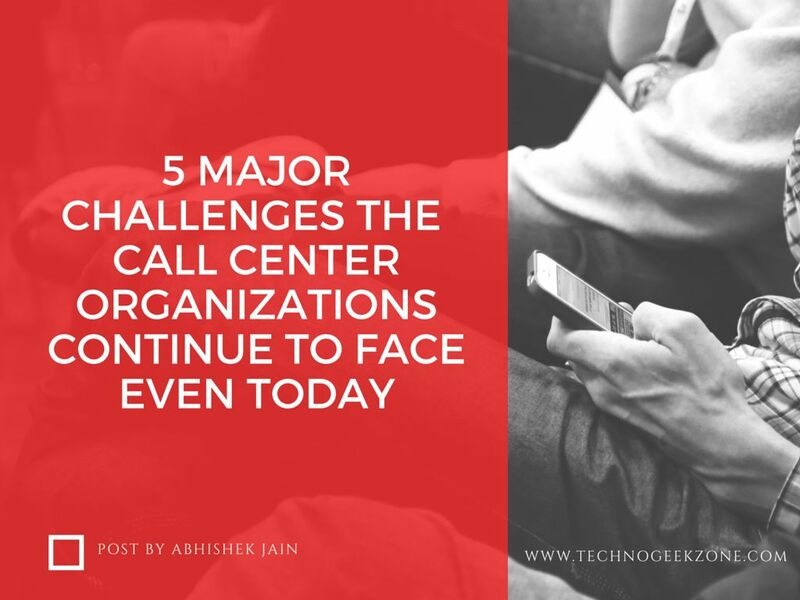 To conclude we are aware of the fact that there are five more challenges that the call centre industry can turn out to face and is impossible to count on them. So what are the major challenges you have faced while dealing with the call centre industry. Abhishek Jain has over 10 years of experience within the BPO Industry and Human Resource outsourcing services. BPO and call center services India delivers and manages various offshore/onsite projects in various technologies and domains.